jSquid is a Java-Applet used for displaying FunCoup result graphs. 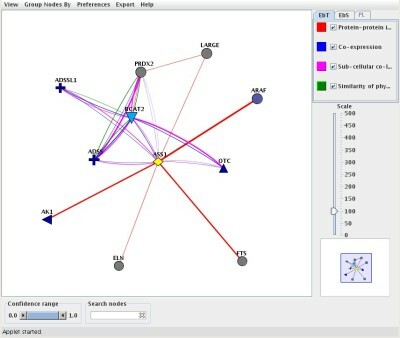 It is based on Medusa but offers several new features to explore and manipulate the graph. The program is published under the GPLv3, therefore it is free of charge and can be used and modified by anyone according to the license's policy. jSquid has been published in Bioinformatics. The tutorial for creating XML input files has been added. The first public release of jSquid is ready and can be downloaded from this page.The homepage is not complete yet, a tutorial will follow in January 2008.